Transcend International, is bringing our suite of professional transformational coach training programs to the United Kingdom again! We are significant global provider of world-class accredited coach training programs, and we are coming to the United Kingdom from October 8-13, 2018 to deliver professional, transformational and mindfulness-based coach training programs accredited by the International Coach Federation (ICF) and the European Mentoring and Coaching Council (EMCC). What is professional transformational coaching? Transformational coaching has everything to do with people becoming more resourceful in key moments of choice. Transformational coaches help people become more skilful at paying attention to and choosing actions which create movement toward what is truly important and meaningful to them. If you have, and we all have, forgotten to remember what is really important in a moment and acted in a way that was unskilful or even detrimental to your goals, then you understand. Learn more by reading Transcend’s Coaching Point of View. What is professional mindfulness-based coaching? Coaches are increasingly finding their clients stuck in patterns of behaviour which take them away from their goals. The coach could risk feeling stuck themselves as they observe their clients not “moving forward”. Behavioural change starts from within, with changes in “mindset” rather than just “skillset” being the foundation for inner and outer transformation. This unique offering equips coaches with mindfulness and mindfulness-related skills that can support themselves and their clients to shift mindsets in a way that supports profound change. Learn more by reading this article on How Mindfulness Can Benefit Your Coaching Practice. We are offering 3 of our coach training programs in the UK: Advanced Certificate in Professional Coach Training, Mindfulness-based Coach Training, Advanced Certificate in Mindfulness-based Coach Training. *Note on the Advanced Certificate in Mindfulness-based Coaching: There will be 4 x 1.5 hour webinars in September as pre-work for this certification program and 4 x 1.5 hour webinars following the live delivery dates. Click on the program image to see the dates. Mentor Coaching and Observed Coaching Practice will be scheduled at your convenience. **Note on the Certificate in Mindfulness-based Coaching: In addition to the module delivered live on October 12-13, 2018, there will be 2 more days of training required to complete this program. These will be coordinated with the participants at a later date. Overview: This program is the second level of coaching certification in our International Coach Federation (ICF) Accredited Coach Training Program (ACTP) and also qualifies for 63 Approved Coach Specific Training Hours (ACSTH) or 63 Continuing Coach Education Units (CCE). The Advanced Certificate in Professional Coaching program consists of 2 Modules on Transformational Coaching, which have been integrated into a 4 day intensive program and 8 webinars (4 prior to the program and 4 post-program). There are also 6 hours of Mentor Coaching, Observed Coaching Practice, Reflective Learning Assignments and an optional Coaching Practicum. Overview: This unique program is designed to develop coaches who are skilled in integrating mindfulness-based approaches into their coaching practice. It all begins with the coach enhancing their own mindfulness skills and then moves into the practical dimensions of integrating mindfulness into coaching in a professional way. 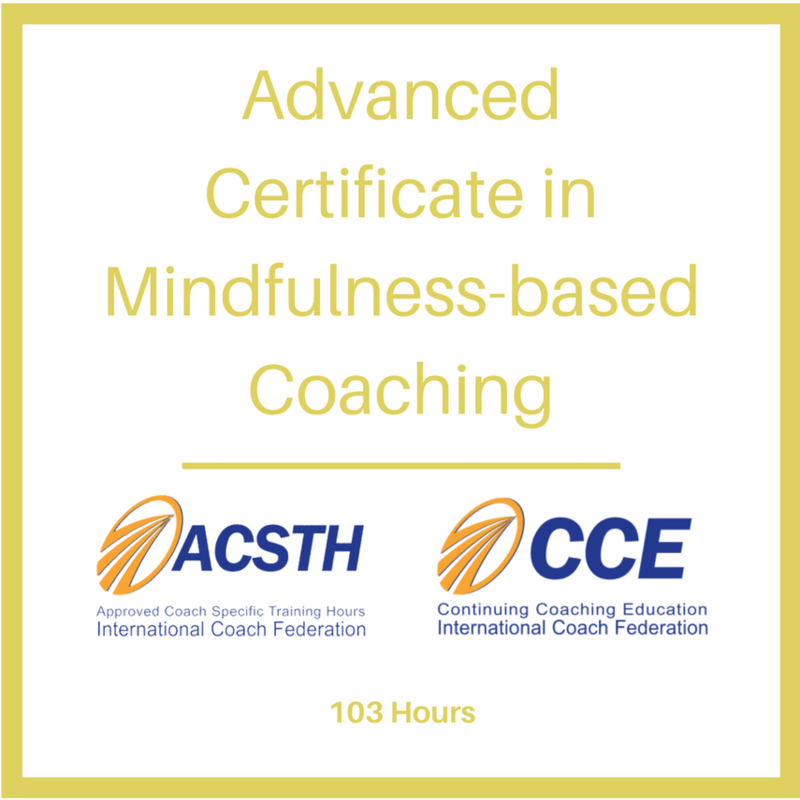 Coaches often combine this program with our Advanced Certificate in Professional Coaching to complete the Advanced Certificate in Mindfulness-based Coaching. This program is currently in the application process for 40 ICF ACSTH or CCE hours. Overview: This certification program will deepen and expand coaching skills and competency preparing coaches to coach at the Professional Credentialed Coach (PCC) level as defined by the International Coach Federation (ICF) and the Senior Practitioner level as defined by the European Mentoring and Coaching Council (EMCC). This program is currently in process for 103 ICF ACSTH or CCE hours. The Advanced Certificate in Professional Coaching program consists of 2 Modules on Transformational Coaching, which have been integrated into a 4 day intensive program and 8 webinars (4 prior to the program and 4 post-program). There are also 6 hours of Mentor Coaching, Observed Coaching Practice, Reflective Learning Assignments and an optional Coaching Practicum. The third Module on Mindfulness-based Coaching is delivered on Friday and Saturday with the remaining 2 days to be confirmed. If these dates are not suitable for you contact us about our online programs which you can take at your own time. Furthermore, if you would like to bring and customise this training to a larger group of people at your corporation or organisation, we also offer organisational programs which we can customise based on your team’s needs. Overview: This program is the second level of coaching certification in our International Coach Federation (ICF) Accredited Coach Training Program (ACTP) and also qualifies for 63 Approved Coach Specific Training Hours (ACSTH) or 63 Continuing Coach Education Units (CCE). Audience: Individuals, consultants, trainers, therapists and facilitators who want to become competent in the application of coaching skills in a variety of professional and organisational contexts. If you have developed an appreciation for the effectiveness of coaching approaches in enhancing learning, development and meaningful change then this ICF accredited program will enable you to begin to practice with confidence. Leaders, Managers, Human Resources and Learning and Development professionals who coach as a part of their role will find this an excellent program. This module lays the foundation for vertical development and transformational coaching and provides powerful tools to co-create transformational coaching relationships. This program will deepen and expand coaching skills and competency preparing coaches to coach at the Professional Credentialed Coach (PCC) level as defined by the International Coach Federation (ICF) and the Senior Practitioner level as defined by the European Mentoring and Coaching Council (EMCC). Learn more through clicking our program page below. Overview: This unique program is designed to develop coaches who are skilled in integrating mindfulness-based approaches into their coaching practice. It all begins with the coach enhancing their own mindfulness skills and then moves into the practical dimensions of integrating mindfulness into coaching in a professional way. Audience: Coaches, mindfulness practitioners, organisational psychologists, individuals, consultants, trainers, therapists and facilitators who want to become highly skilled in the application of coaching skills integrating mindfulness based practices in a variety of professional and organisational contexts. Leaders, Managers, Human Resources and Learning and Development professionals who coach as a part of their role will find this an excellent program. 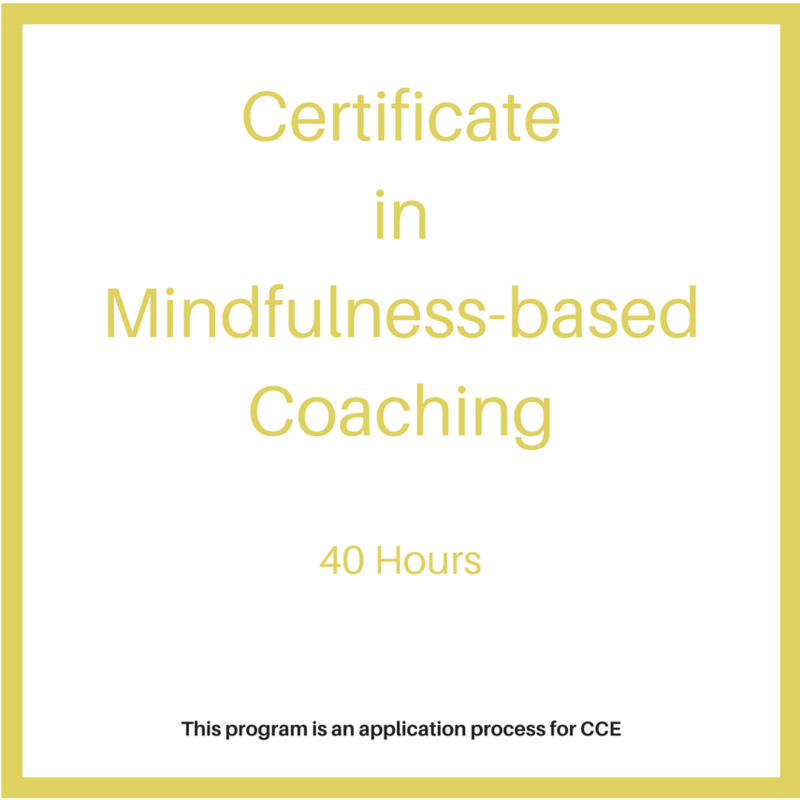 This program deepens and extends the coaches own mindfulness practice and enables them to become skilled in the practical integration of mindfulness practice into their coaching practice. Overview: This certification program is the combination of the Advanced Certificate in Professional Coaching and the Certificate in Mindfulness-based Coaching, both outlined above. 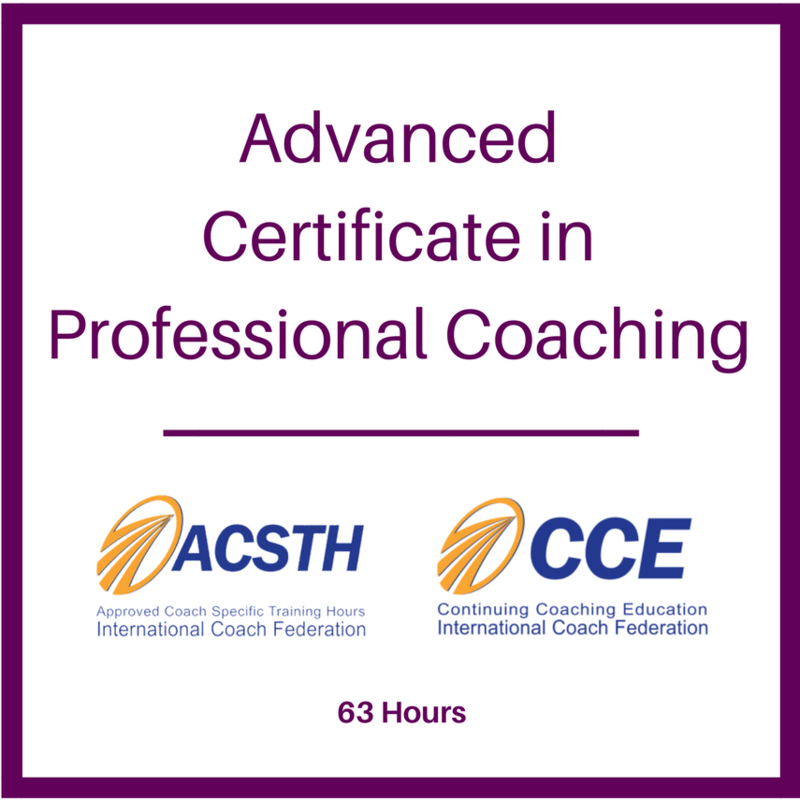 This certification program will deepen and expand coaching skills and competency preparing coaches to coach at the Professional Credentialed Coach (PCC) level as defined by the International Coach Federation (ICF) and the Senior Practitioner level as defined by the European Mentoring and Coaching Council (EMCC). This program is currently in process for 103 ICF ACSTH or CCE hours. Audience: Coaches, mindfulness practitioners, organisational psychologists, individuals, consultants, trainers, therapists and facilitators who want to become highly skilled in the application of coaching skills integrating mindfulness based practices in a variety of professional and organisational contexts.